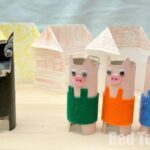 We do love a good Toilet Paper Roll craft.. and today, we combine our Toilet Roll love with our love for Fairy Tales – creating a cute Toilet Paper Roll Little Red Riding Hood play set or story telling props. 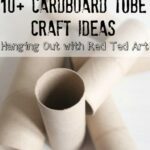 This craft was “designed” especially for the Kids Crafts 101 “Blog Hop” – a special series – bringing together 14 of my fabulous fellow crafters to share with you crafts for those rainy days made from “every day” craft items. 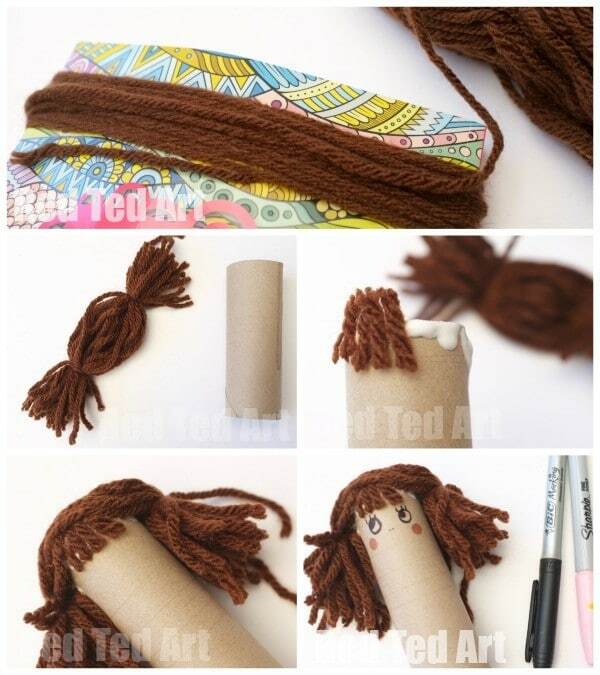 I have the honour of kicking off the series with our Toilet Paper Roll Craft. 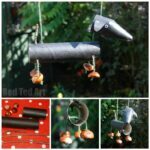 Combine it with some scrap fabrics and you all you need is a little imagination to create any of your favourite fairy tale characters. We show you how we made ours and challenge you to make more of your own! 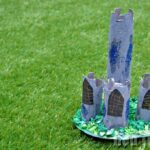 If you love Fairy Tale Crafts and Fairy Tale Story Telling Props.. we have lots more for you to check out! 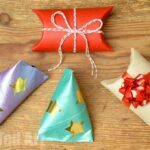 Be sure to visit Meri Cherry next in the Blog Hop series, for her lovely Kids Craft and revisit the 14 Kids Crafts 101 page each to find links to the next idea. Rainy Days? Snow Days? Loooong Summer Days? NO PROBLEM! We have you crafty sos covered! 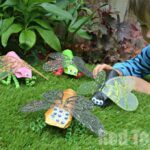 This Toilet Roll Fairy Tale Craft was first published in April 2015 and has been updated and republished for your convenience! The material list below MAY SEEM LONG… but it is all about rummaging around your craft box and looking at what you can find! Adapting it to YOUR materials in YOUR home. I have listed what WE used… but you don’t have to use the same things!! Make this your own!! I made the Little Red Riding Hood. Later Pip Squeak helped me make the Granny. 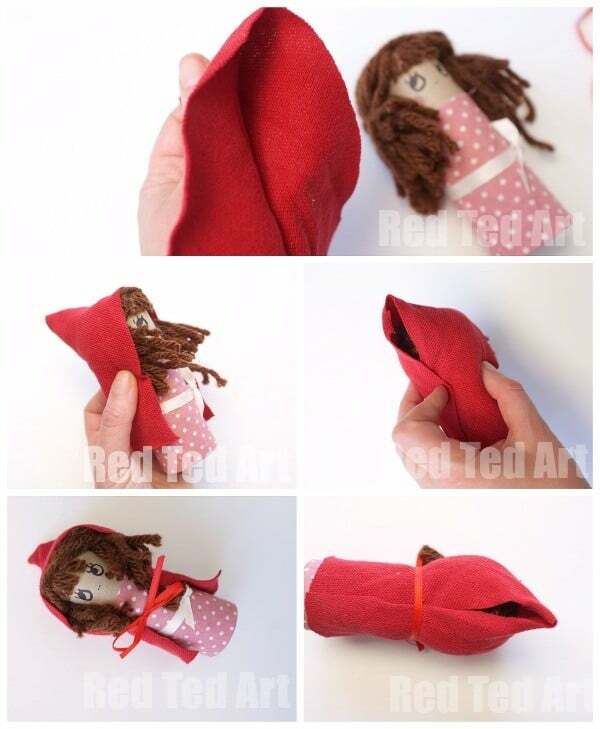 1) Here are the steps showing how to make Little Red Riding Hoods hair. This is a handy “technique” for any dolly hair!! In retrospect, I made her hair a little to thick to go under her red cape, so you may want to thin it out a little! To start with, I wrapped some brown wool around a book, to get “equal length strands”. 2) I then cut them and tied more brown wool round them, to create “bunches”. 3) I then cut a little fridge out and glued that on. Then applied lots of glue and carefully placed the rest of the hair on top, adjusting it I went. 4) If need be trim you hair a little. 5) Then add a face. I did not do a mouth as I thought Little Red Riding Hood’s emotions change a lot throughout the story…. my kids later insisted that it looked odd and at the very end she did get a mouth! 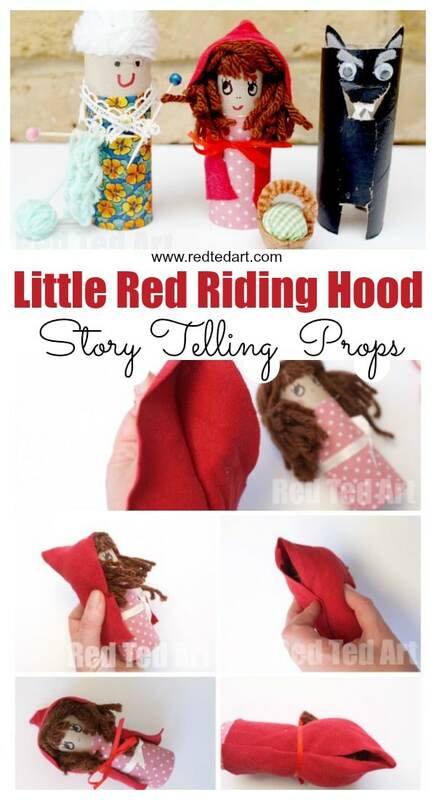 Next up we have Little Red Riding Hood’s Clothes. 1) I cut a rectangular piece of pink polka dot fabric and glued it on – ducking the end bit into the inside of the TP Roll.. but you can trim it too. I added a Ribbon as a waistband, but later decided that I didn’t like it and removed it… in other words: play and see what works for you. 2) The best bit about the cape is that it is “no sew”. I literally secured I in place with ribbon. I used a long piece of rectangular t-shirt fabric (approx 24cm log and 8cm wide, though it could have been a little longer). 3) Fold in half. 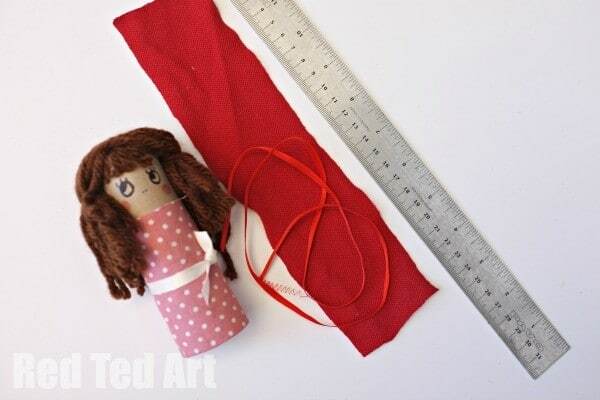 Hold the back to make the cape shape and gently put over the Little Red Riding Hood. At this point I literally just pulled and pushed into space – pinching it to make the long pointy hood. You CAN sew it shut if you want – but as you an see from my pictures, it really is just secured by a ribbon! 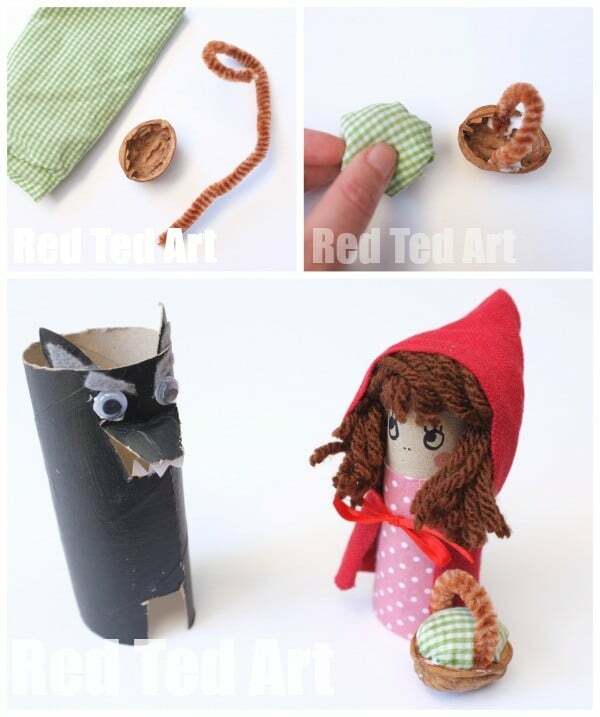 Finally, I thought it would be nice for our TP Roll Little Red Riding Hood to have a Walnut basket to take with her. 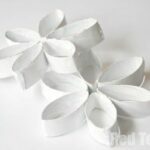 Again, have a look around at what you have at home and see what you could make this from (ore make a little paper one?). 1) I glued the pipecleaner in place. 2) Then took a round pieces of fabric, stuffed it with left over wool, bunched it up and glued it in place. Done! My daughter came home from school and ask “where is Granny”, can we make one now? And… “I think Granny should have some knitting needles”. 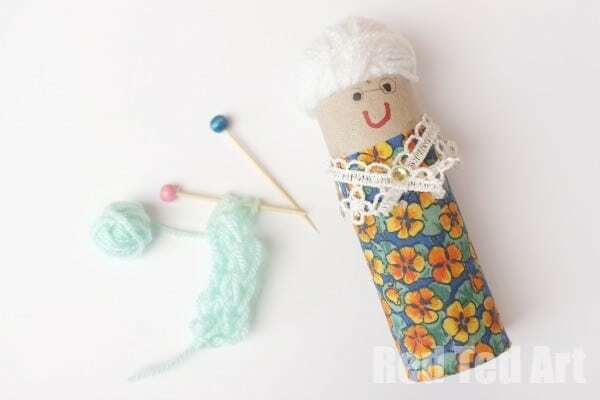 I love how SHE went off and found some toothpicks and beads and decided to make her own dolly size knitting needles. I was astounded at her creativity aged 5. A few days later she mentioned she had seen some like these in a book.. Still, I am impressed that she remembered and decided to make them! 2) She then went off and did some finger knitting as “pretend Granny knitting”. We glued the knitting in place and made a small ball of wool, that we also glued so it doesn’t become unravelled. 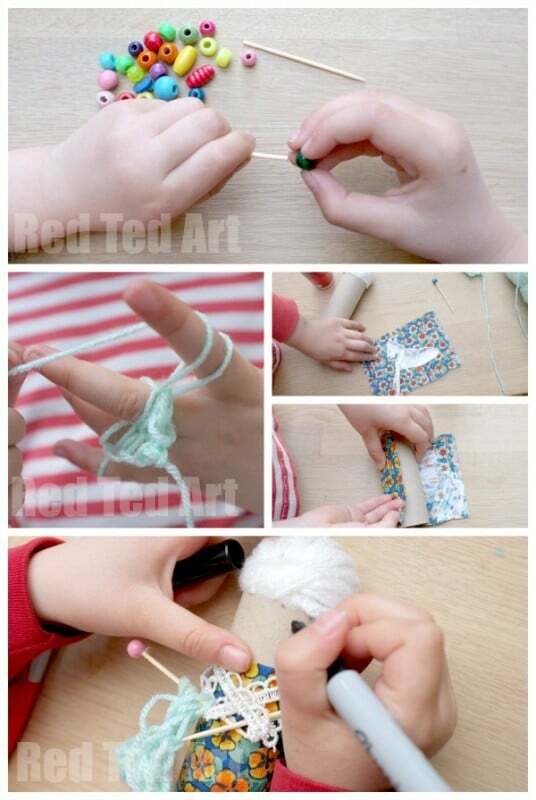 3) For Granny’s hair we used a ball of bubble wrap and wrapped that in white wool and glued it in place. 4) Pip Squeak chose some fabric for her dress, I cut out a rectangle, she added glue and wrapped it around the TP Roll. Ta-da… one TP Roll Granny ready!! Finally, we dug out our Mr Wolf, from our Mr Wolf and the 3 Little Pigs Craft a while back and our set was complete!!! Now all we need is the Wood Cutter, which my son really wanted to make (complete with tooth pick axe), but we haven’t had a chance to yet!!!! These are just too cute! 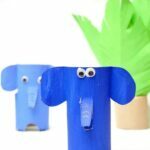 I love them and can imagine the endless fun kids will have creating these. Thank you! I love how my kids were super excited by these and ready to create MORE! So cute! I love how TP rolls are so multifunctional. It’s great thing when you can turn disposables or waste into something cute and beautiful. Yes, aren’t Loo Rolls simply the best like that? !